Events during the summer of 2015 bore an air of déjà vu. The initial gap between Greece and its partners was significant. The frequency of meetings increased as time (and cash) ran out, with little to show in terms of progress. The discussions were held at an increasingly higher political level, but the core of the discussions remained of a “technical nature”. At its climax, the Greek Prime Minister held a referendum whose two questions were incomprehensible for citizens. Then, the Greek government operated a complete U-turn, signing third Memorandum of Understanding (MoU) containing harsh(er) conditions. The unfolding of events resembled the drama surrounding previous reviews of the second MoU, when the Troika would spend endless weeks in Athens prior to the disbursement of a tranche. Apart from theatrical grandstanding unusual for EU summitry, the difference with previous episodes lies in the stakes. This time round, the cost of the stand off amounts to percentage points of GDP. 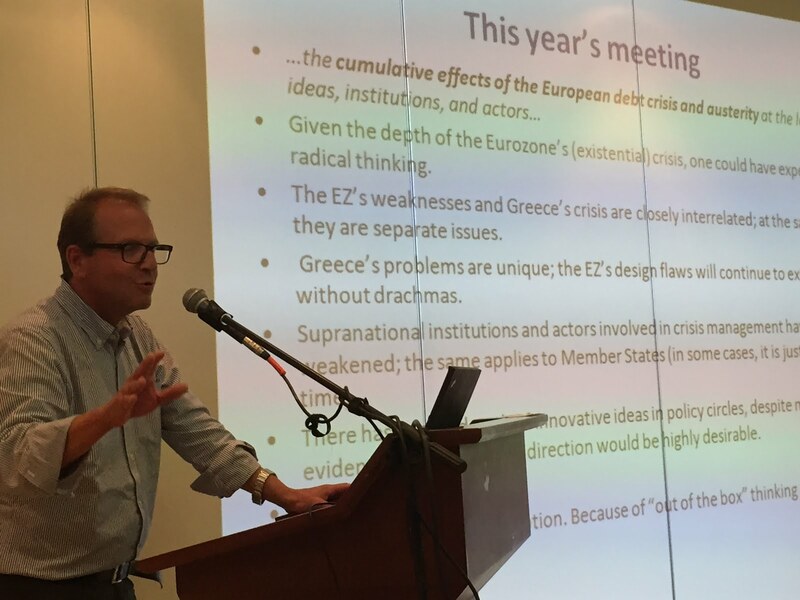 In addition, supranational institutions and actors involved in the management of the crisis have been weakened; the same applies to Member States. The design of the third bail-out also bears a close resemblance to its predecessors. There has been a dearth of innovative ideas in policy circles, despite mounting evidence that a change of direction would be highly desirable. The perceived solution consists of front loaded fiscal adjustment and “structural reforms”, with the latter being equated to the passing of laws. The contemplated reforms are “ambitious” and the timetable even more so. As was to be expected, Greece plunged back into recession, putting further doubts on the country’s ability to service its debt. Growth prospects remain elusive. Beyond altering expectations, structural reforms do not generate short term growth per se. What they do, when properly designed, is to create the conditions for putting growth on a sustainable path. Sustainability must be understood in a broad sense, going beyond fiscal aggregates and encompassing social and environmental sustainability. In the medium term, growth, to be sustainable, requires continuous productivity improvements. Without them, growth is an optical illusion that usually ends up in tears. It is quite telling that the first and second MoU only mention productivity in the context of market liberalization; the third MoU does not mention it even once. “Structural reforms” have been both deep and insufficient. The “horizontal measures” (tax increases, pension and wage cuts) have been unprecedented for a European country. At the same time, too little progress has been achieved regarding genuine structural reforms, i.e. reforms that change the way the economy functions, adjusts and grows. By now, we know (or at least we should know) that it takes time to design and implement genuine reforms. The costs are typically front loaded, while the benefits take time to materialise, are diffuse and hard to quantify. In Greece, they have to be implemented in an extremely adverse environment. "Reforms" have often been half-baked, regularly ending with rushed through legislative adoption as “Prior Actions” without proper follow-up, often due to limited resources. The lack of tangible benefits stemming from reforms has convinced a growing proportion of the population and public service that "reforms" are not well designed and/or not leading anywhere, i.e. not worth pursuing. Reform exhaustion has set in. Even before crisis, Greek civil service was known for its structural weaknesses. By now, it is demoralised and weaker, as many of its better performing staff left. Public servants enjoy very little effective autonomy, as they fear harsh punishment if they displease their political masters. This leads to administrative formalism and stasis. Yet, it is this weakened civil service that is supposed to design and implement structural reforms. The third MoU rightly emphasizes the need for Greek ownership of the adjustment programme. This is quite a challenge, as the programme is perceived as the imposition by foreigners of extremely harsh conditions. Parts of the current government have openly stated their dislike of any reform related to the programme (Minister Spirtzis publicly lamented that he had to sign off the privatization of regional airports). Programme implementation is a “Principal-Agent” problem. The “Principal” (the decider) is made-up of creditors and the Troika and the “Agent” (the implementer) consists of the Greek government and public administration. The respective objective functions and associated incentives of the two parties differ significantly. The Principal cannot implement directly and suffers from information asymmetry (the drafting of detailed requirements in the second MoU has often resulted in revealing to the Greek authorities the extent to which the Troika did not have the full picture). In short, the creditors/Troika want something to happen and has to rely of Greek authorities to make it happen. Difficulties arise when the incentives are too misaligned. To a large extent, the limited success of the previous programmes derives from the lack of incentive compatibility. “Greek ownership” is basically an issue of aligning incentives. Determining who the “Principal” is and how it set priorities is an interesting question, given the diversity of actors involved (the three components of the Troika, the EuroGroup that take decides but delegates implementation to the Troika, Member States, the European Council, and the EU Commission beyond its participation in the Troika). Multiplicity of interlocutors has added a layer of complexity to a challenging situation. There is no panacea to the Greek drama, but a route worth exploring is to identify reform areas that are “win-win” and that could deliver positive results over a relatively short time span. That could contribute to alleviate reform fatigue and show that well designed reform are worth implementing. To be “win-win”, a reform must be to the liking of the Principal and yield a positive cost benefit ratio for the Agent. In practice, the latter implies focusing on projects that involve few, if any, costs to local constituencies or vested interests. If these conditions are met, implementation would be incentive compatible. There are such reforms, but that have been partially (and often reluctantly) implemented, or not at all. I limit myself to mention three of them: the introduction of a well targeted Guaranteed Minimum Income (GMI), the development of a fully fledged export strategy, and cost effective, incentive compatible ways to close the VAT gap in the form of a Portugal like “VAT lottery”. Three final remarks. Overambitious reforms and deadlines lack credibility and hence are not incentive compatible. In the best of cases, they produce short term patches. Second, in order to achieve incentive compatibility at the micro level, civil servants that contribute to the design of genuine reforms and participate in their implementation should be rewarded for their efforts. Third, in view of Greece’s weak administrative capability and the nature of the challenges, reforms projects should be implemented on a pilot basis whenever feasible. Pilots are a cost effective way to carry a “proof of concept” for a particular reform, avoiding large scale costly errors. The experience with the embryonic GMI project bears this out.